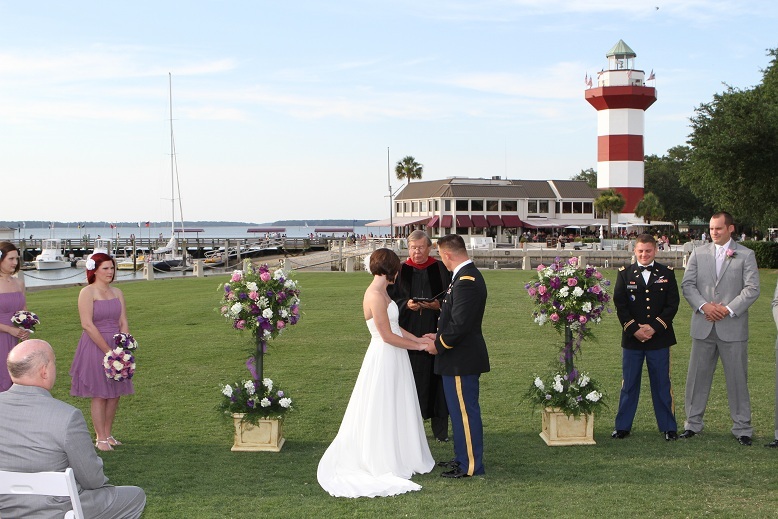 In recent years, thousands of couples have chosen Hilton Head Island or the surrounding Carolina and Georgia venues as they and their families and friends travel here to solemnize their marriages or renew their wedding vows. The Rev. 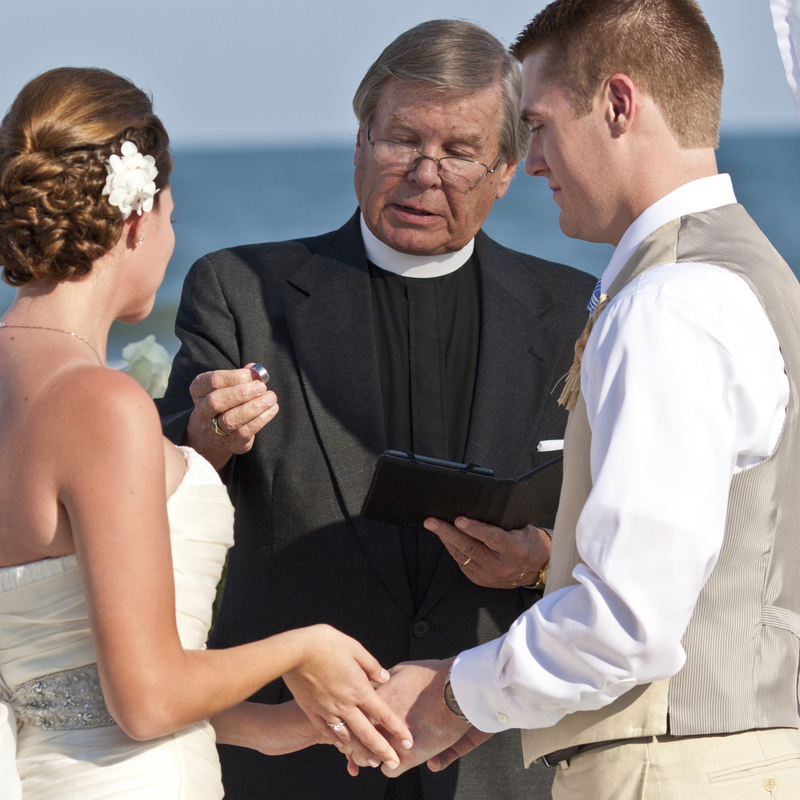 Dr. David Leininger, a retired Presbyterian minister living on Hilton Head, has become well-known as one of the best and most sought-after wedding officiants in the area and is happy to help you in creating a ceremony that is uniquely YOURS. We would love to TALK with you about your plans. In a world where folks are regularly seen texting one another across a room, we appreciate the human touch. Feel free to CALL us about your ceremony. We are happy to help with questions you may have about venues, weather conditions, legalities, or any other subject. Our number is 843-363-6161 or cellular 814-730-0080. If we are not immediately available, we will get back with you as soon as possible. One couple recently wrote, "You can tell that he is passionate about what he does, invests a great deal of time into each of his weddings, and wants to ensure all couples get the wedding of their dreams. Ours truly was, "A Wedding in Paradise." Despite occasional ups and downs, our society has always held marriage in high regard. From a theological perspective, marriage is instituted of God, regulated by God's commands, blessed by our Lord Jesus Christ, and is to be held in honor among all people (Hebrews 13:14). Weddings need not be elaborate affairs to be beautiful. The important things are the sincere commitment you bring to it, the affection which makes it rich, and the wealth of meaning which lies in the vows you will take. We trust that the experience we will share together as you unite in marriage will be most memorable and one upon which you can look back with great satisfaction as the years go by. Details, Details! One of the most important is the Marriage License. Those who officiate at weddings are instructed in no uncertain terms that no ceremony is to take place without that License in hand. In South Carolina, a couple must appear in person at the appropriate county office, provide proof of identity, fill in the proper forms and pay the applicable fee. If there is a previous divorce involved within the past twelve months, the Divorce Decree must also be presented. There is a 24-hour waiting period before any wedding can take place, but there are no blood tests or physical exams required. To get all the information you need for proceeding to the next steps, click here to get your questions answered. For those planning to apply for their license at the Beaufort County government center on Hilton Head Island, please note that the office is only open Tuesdays, Wednesdays and Fridays from 9:00 AM-4:00 PM by appointment only. For information call (843) 255-5850 for the Beaufort office or (843) 255-5866 for Hilton Head Island's satellite office. For those who are planning a beach wedding on Hilton Head Island, please note that a permit is required from the town prior to the ceremony. Click here to get the proper form for submission. If the wedding is to take place in Georgia, click here for the appropriate information. Georgia does not require a waiting period. Although it has its social and legal elements, the marriage ceremony also has aspects of worship, a fact which should be kept in mind as plans are made for your special day. Therefore, we expect that wedding services will provide a sense of decorum, order and tradition. The minister can answer any questions you may have concerning the appropriateness of specifics to be included within the service. Dr. Leininger will consult with you concerning elements of the service (music, prayers, vows, etc.). Since none of these elements are required either by law or custom, you have a great deal of freedom in determining how your service will look and sound. We celebrate the fact that THIS IS YOUR DAY, and we will do our best to make it as meaningful and memorable as you have always dreamed. Words of Welcome - "Dearly Beloved, we are gathered here together in the sight of God and these witnesses..." are one traditional way of beginning the wedding service. You may choose the words you would like to set the tone of the event. Invocation - People of faith want God's involvement in every area of their lives. Certainly, we ask God's blessing at such a momentous time as this. Readings from secular literature and Scripture - There may be particularly meaningful passages that you wish to have read to indicate the type of foundation you wish to establish for your new life together. Brief Homily - Generally, Dr. Leininger will share some brief remarks concerning our common understanding of the momentous event taking place. Declarations of Intent - "Do you take this woman/man to be your lawfully wedded wife/husband, to have and to hold from this day forward..." are another set of familiar words to indicate a seriousness of purpose. Those ancient phrases are appropriate as are other more contemporary expressions. Exchange of Vows - "For better, for worse, for richer, for poorer, in sickness and in health..." are equally familiar and are the choice of many couples in solemnizing the marriage. More contemporary expressions of fidelity are equally appropriate and may provide a more personal choice. Presentation of Rings - "With this ring I thee wed..." is another phrase that has become meaningful through repetition. Again, there are choices available to you as to how you will offer a visible symbol of the new life that is being begun here. Prayer of Blessing - Once more, we humble ourselves before God and ask divine blessing on the new life journey that is about to begin. Charge and Benediction - Last words to remember concerning the love and care that life partners are to show for one another along with the assurance that God is with you through all the joys and sorrows of life. The Kiss - This never changes. No explanation necessary. In addition, there may be other elements included (Unity Candle, Sand Ceremony, etc.) as you desire. If special music is to be included, it can be placed in the Order as appropriate. You may well decide that these choices are more than you care to deal with and you are most content with letting the officiating minister use the traditional forms with which we have grown up. That is perfectly fine. The point is that this is YOUR DAY. These decisions are yours. If you so choose, click here to begin making your choices. Will everything go exactly as planned everytime? Well, as this link attests, not always (this was not one of our weddings, by the way). No Matter. We are here to help and we join you in wanting this magnificent occasion to be as memorable and beautiful as it can be. Check the calendar below for the date and time of your wedding (and rehearsal) to see if we are available. As we noted above, we are ofetn asked to officiate at more than one wedding on a particular date. If the logistics work (time and location) feel free to make your request. If there is a problem, we will let you know and assist you in making other arrangements. As noted above, modern weddings, especially destination weddings arranged from a distance, can be overwhelming considering the details involved. Click on the buttons below for information about photography and videotaping, wedding music, and the wedding rehearsal. Filing of legal documents following the service. A deposit of $100.00 is requested at the time of initial arrangements with the balance due no later than the day of the ceremony. If there are unusual circumstances regarding travel or accommodations, any additional fees would be negotiated prior to making final arangements. In addition, if there are items for which you might wish an adjustment, we are always ready to have a conversation. Fill out the Ceremony Information Form online and submit it electronically or print out the hard-copy version of the Form, fill it out as appropriate, and mail it to the address provided. We will respond as soon as possible and begin finalizing arrangements for you. If you have already contacted Dr. Leininger and learned that he is available to officiate on the date and at the time you are requesting and you would like to remit your deposit via PayPal, that is perfectly acceptable. Click on the PAY NOW button below, fill in the appropriate amount, submit it, and we will get you on the calendar. Failure to pay the deposit within fourteen days of the initial arrangements will automatically cancel the agreement. Deposits are 100% refundable up to 90 days prior to the reserved date for a mid-week (Mon-Thur) ceremony or 120 days prior for a weekend (Fri-Sun) event.